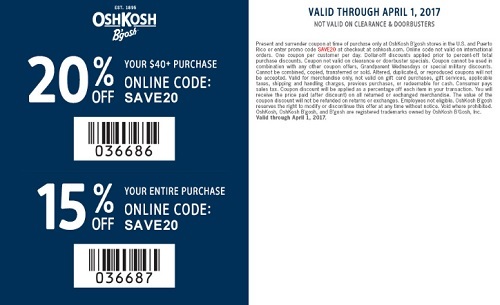 U.S. OshKosh B'gosh gives you the chance to save big! Take 20% off your purchase of $40 or more. Online use the promotion code SAVE20. Or, take 15% off your entire purchase. Online use the promotion code SAVE15. In-store use the printable coupon during the time of your purchase. Offer is valid until April 1, 2017. More details available at U.S. OshKosh B'gosh store locations or U.S. OshKosh B'gosh online.